They were happy together... right? For a society that loves to gawk at human misery, it should be surprising that every media outlet across the nation prioritized the royal wedding over hundreds of tornado related deaths. Thousands of families across the South have been uprooted and destroyed but America would rather watch the most privileged family in the world celebrate themselves. One of my favorite journalism professors used to say that the news is a hybrid of what people need to know and what they want to know. The royal circus of the past few weeks goes to show how unbalanced those two factors are. For those of you reading this who actually woke up at before dawn to celebrate diluted imperialism, I ask you this: When was the last time you woke up at 5am to do anything to improve the world around you? If you’ve got a good answer please comment because my faith in the news consuming public is at an all time low. 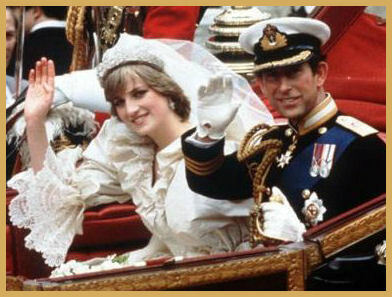 Note: The editorial staff at andrewbruss.com is fully aware that the divorce of Prince Charles and Lady Di statistically dispositions Kate and William’s marriage to failure. I've been getting up at 5AM some days to start prepping for my volunteer group's projects. The students have been doing SO well with the events, and though I haven't had a weekend to myself in two months, and won't for quite a while, the teens' curiosity and ambition makes getting up at 5am completely worthwhile. This was a breath of fresh air that's all O2 Rebecca! Those are some lucky kids... Lucky community! If you're not into the royal wedding, do you get a free pass for not doing much to improve the world around you? Also, we all have our guilty pleasures. We need them. I totally agree with you that our collective consciousness can sometimes be woefully misplaced (for example, my current causes that not enough people are paying attention to: http://www.newyorker.com/reporting/2009/03/30/090330fa_fact_gawande and http://www.slate.com/id/2290036/), but I think the important causes need to find ways to exist in conjunction with the fluff. People aren't going to stop being interested in royal weddings (or the Jersey Shore, or the Real Housewives of wherever, or any of that other mindless crap), and sometimes we need that escape, especially in the face of tornado destruction, civil wars in the Middle East, and the depressing fact that anyone is listening to Donald Trump. I think there has to be room for media that entertains, as well as media that informs. Ariel makes a good point. "I think there has to be room for media that entertains, as well as media that informs." The problem is that the two have become intertwined. Perhaps the royal wedding should be in the entertainment section, not the front page. They should also put The Donald in the entertainment section. I agree that News should be informative as well as entertain. With the conflicts in the middle east, unemployement at record highs, and the tragedies across the south this past week, people need distractions from their lives. Although the royal wedding has had a ton of coverage, it's because thats what people want to read about. Local newspapers would not have it on their front page if it did not sell newspapers. As a print journalism major, you especially can appreciate the fact that publications will headline what sells. Yea, it's been a little much, but if that sells papers/gets hits online, why not? I'm a medical student, I'm taking Step 1 of the boards in late June, and I'm starting rotations at a County Hospital in July. In July I will hopefully be helping to make the world a better place. At the risk of being preachy and a little hypocritical, I want to say that its a bit sanctimonious to imply that you doing medical school applications will make the world a better place.